Cooks love feedback, yes we do. So I was really pleased to find that MY KITCHEN IN SPAIN—the book, not the blog—was Cookbook of the Month, along with THE NEW SPANISH KITCHEN by Anya von Bremzen, on Chowhound.com. Readers—home cooks—try recipes from the books and share their comments on the website. The Spanish theme continues through August. 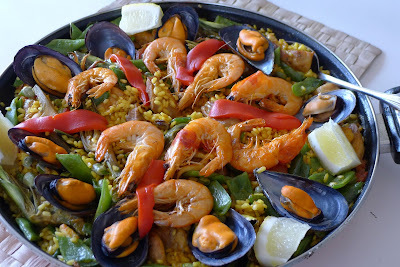 If you’d like to join the discussion, go to http://beta.chowhound.com/post/august-2015-cotm-spanish-table-kitchen-spain-1020813 and follow the links to the threads. I am fascinated to follow how home cooks adapt cookbook recipes. because it shows how the recipes I write really work. For instance, pickerel cheeks instead of dogfish shark for cazón en adobo; sea bass instead of halibut or hake; triggerfish instead of sea bream; pork chops for tenderloin, grapefruit for orange; oloroso Sherry instead of fino. Or, “instinct” calls for less vinegar or more garlic or a different herb. Or, the recipe says cook the chicken 60 minutes, but “mine was done in 20 minutes”. Sherried Chicken with Mushroom (pollo al Jerez, recipe here). 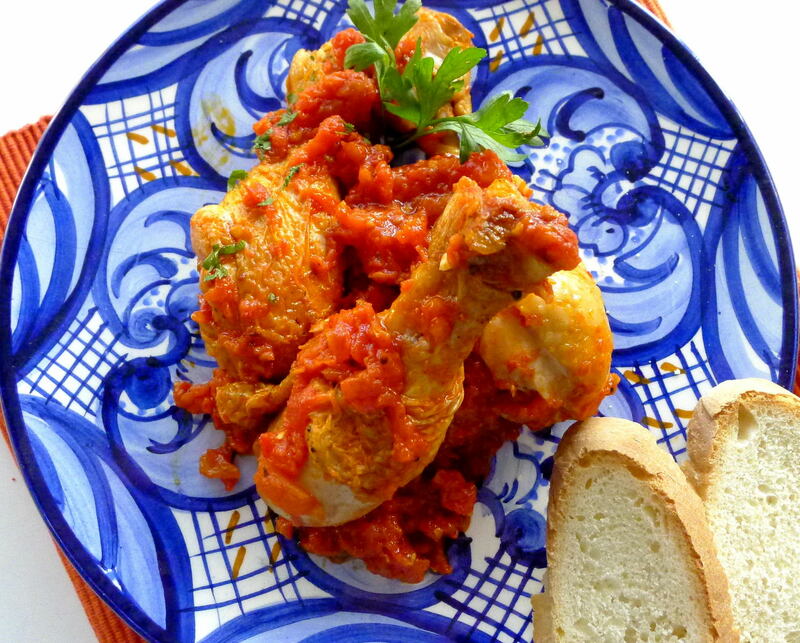 Pollo al ajillo--chicken with garlic. 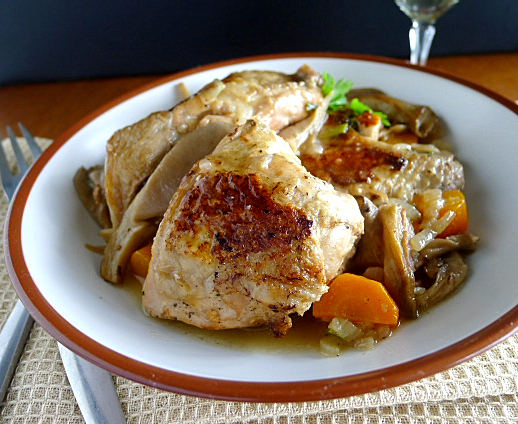 Home-Style Pork Chops in Lemon Marinade (chuletas a la casera). But, I was devastated to read a scathing review of my paella recipe! Paella cooking class: We put in par-boiled green beans, frozen peas and all of the small peeled shrimp. Won’t they be overcooked? That’s not the point. Think of them as flavoring, adding to the total flavor of the rice. Many of the recipes from my cookbook that are reviewed on Chowhound have also appeared on this blog. One that hasn’t yet, Chicken Sautéed with Fresh Tomato, is perfect for this end of summer season. I’ll let Chowhound's “Breadcrumbs” provide the commentary. Breadcrumbs: “Prep is simple but the cooking time required for the sauce doesn’t necessarily make this the best recipe for a weeknight unless time isn’t an issue at your home. Fortunately for me, today time wasn’t a factor at all except when we started inhaling the tantalizing aromas of this sauce and then it was impatience vs a lack of time that proved to be an issue. “Once the chicken is cooked, the sauce must then reduce to the consistency of a jam and this, my friends, is what takes time and patience. The sauce is well worth the wait, sweet, jammy and velvety. I think I’d have been happy with a bowl of sauce and some crusty bread, chicken be damned! I served this atop some lovely steamed fingerling potatoes. It would be equally comfortable with rice or pasta. Fresh tomatoes cook to a thick, jammy consistency. 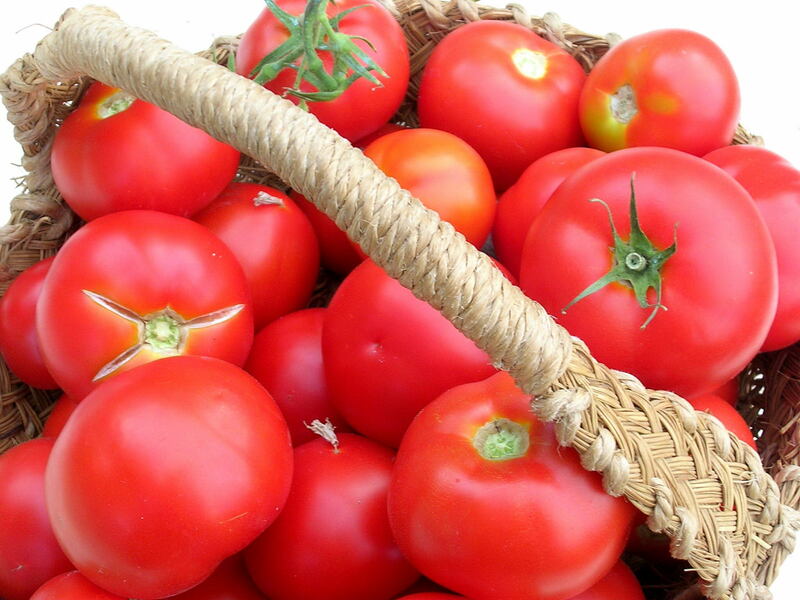 Plunge the tomatoes into a pot of boiling water until the skins split, about 45 seconds. Drain, cool, then slip off the skins. Alternatively, cut out the cores and microwave them for 2 minutes on one side. Turn and microwave for 2 minutes more. Drain, cool, then slip off the skins. Cut the tomatoes in half horizontally and squeeze out the seeds and discard them. 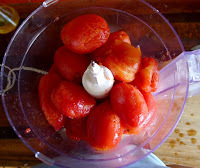 Chop the tomatoes coarsely (they can be chopped in a food processor). Heat the oil In a cazuela or deep skillet and brown the chicken pieces. Remove when browned. Pour off all but 3 tablespoons of the fat. Add the chopped tomatoes, garlic, salt, pepper, thyme, pimentón, bay leaves and brandy. Cook the tomatoes on a high heat for 5 minutes. Return the chicken pieces to the pot. Cook on a medium heat, partially covered to prevent the tomato from splattering, until chicken is tender, about 1 hour. Remove chicken pieces when they are done. Continue cooking the tomato sauce on a medium heat until it is very thick and beginning to brown, about 30 minutes more. Return the chicken to the pot and reheat. 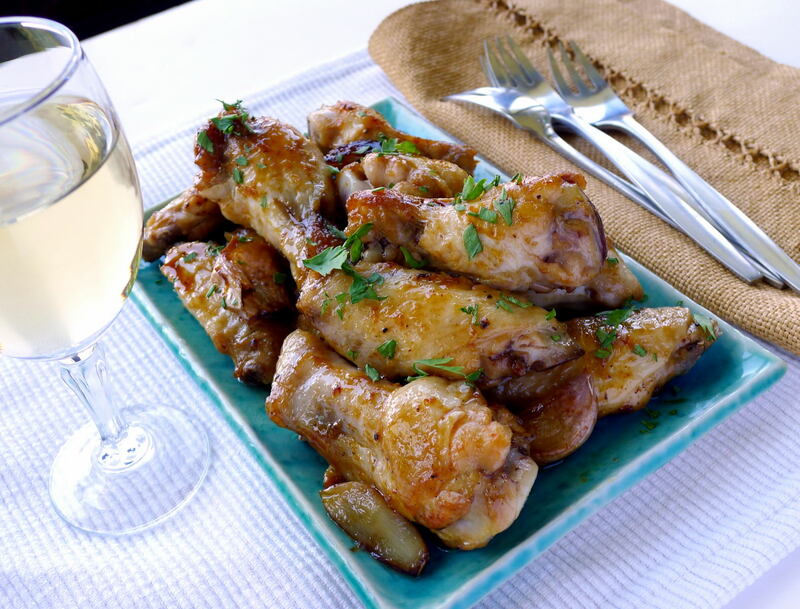 Serve garnished with chopped parsley. 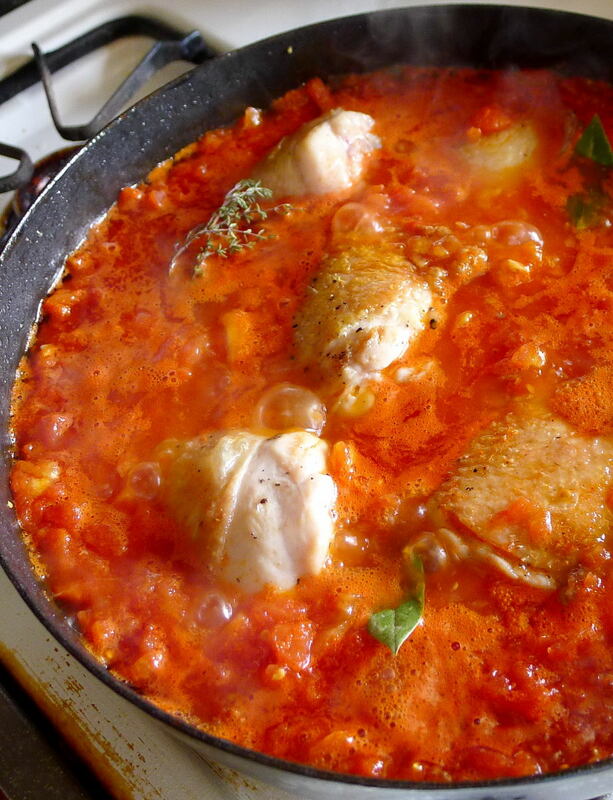 Chicken braises in fresh tomato sauce. It was such a joy and happy experience for my husband and me to cook from your book this month, Chef. We enjoyed the experience and loved the food. At Chowhound the Cookbooks of the Month (COTMs) remain accessible ad infinitum so many of us will be revisiting your book in the months and years to come. Also, it was wonderful that you were at hand and popped in from time to time to add insights and encourage us. Here's to many happy meals in the future. Gio: And, thank Chowhounds for featuring My Kitchen in Spain. Always glad to know folks are cooking from the book. I'll raise a copa to that--To happy meals! I so love [and am now probably giving away my identity] this book. Thank you for your participation. I appreciate it [and I think the rest of the COTM 'Hounds do as well]. And I love the chicken recipe! Anon: Very pleased you like the cookbook. Thanks for trying out the recipes and commenting. Yes, that chicken with tomato is sooo good! My next trip to Spain will probably be Malaga and/or Grenada. Pata Negra: You're welcome! Enjoy Málaga and Granada and all the great food. ¡Viva España! Alanna: So glad you enjoy the blog and the recipes. Absolutely, olive oil is the most essential ingredient in Spanish cooking. It wouldn't be gazpacho without it! Fantastic recipe. I tried this over the weekend and it was a huge hit. Its nice to find such a classic and simple recipe. Have you tried making it with canned tomatoes outside of the growing season? Any luck? 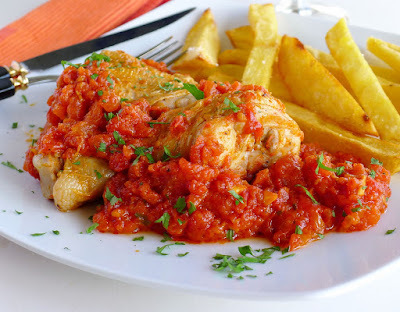 Anony: Glad you liked the recipe for pollo con tomate. It can be simplified to just 3 ingredients--chicken, olive oil and tomatoes! Sure, it works with canned tomatoes--but then I don't reduce the tomatoes to a thick jam--just a regular tomato sauce.